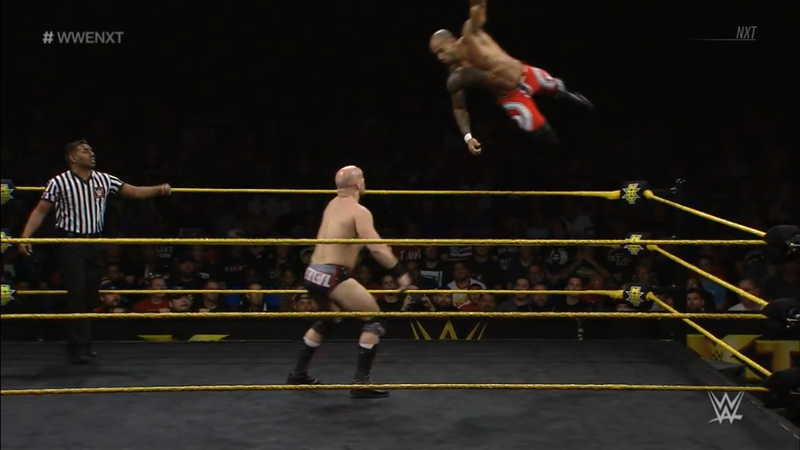 Ricochet VS Fabian Aichner; Ricochet wins. War Raiders VS The Metro Brothers; War Raiders win. 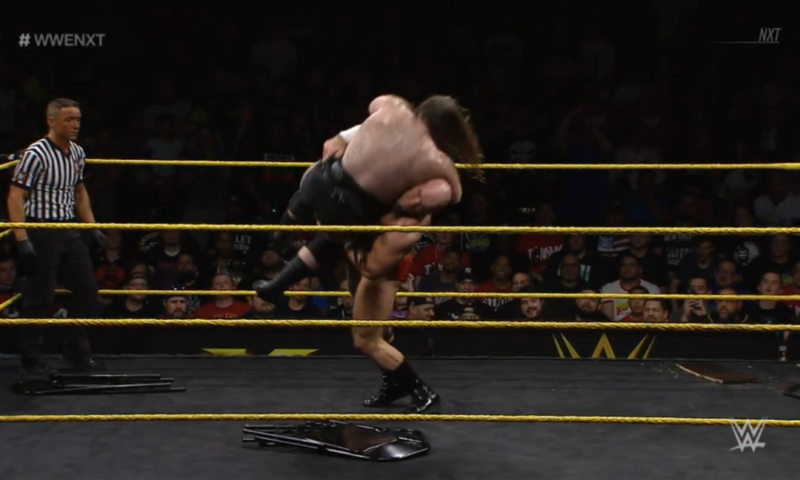 No Disqualifications: Lars Sullivan VS Killian Dain; Sullivan wins. 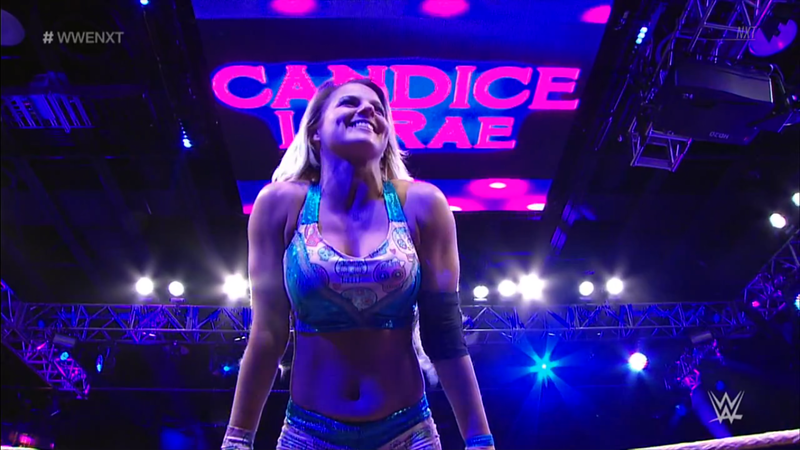 Candice LeRae VS Zelina Vega; Candice wins. 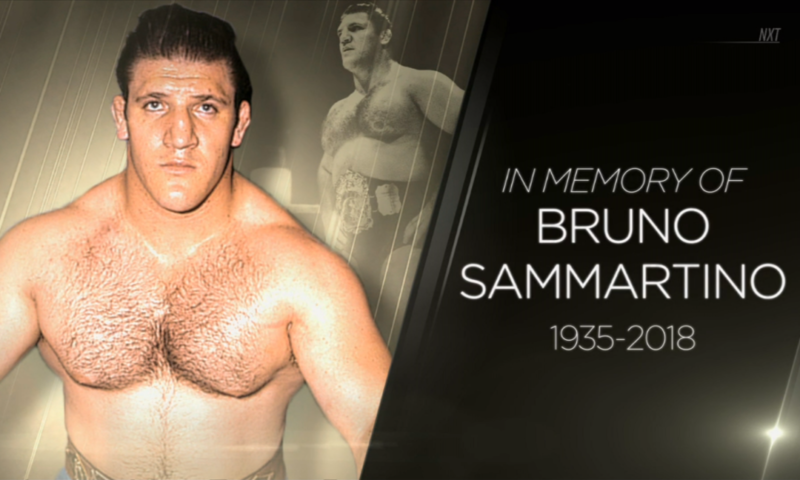 WWE and NXT dedicate tonight to Bruno Sammartino. 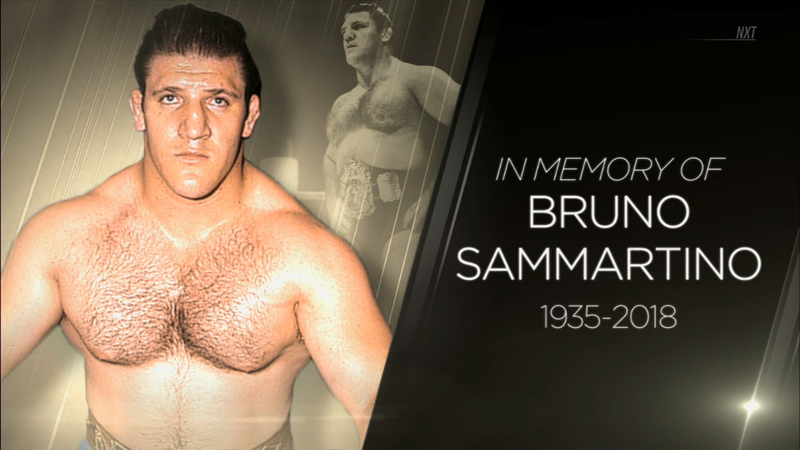 The Living Legend, the Italian Superman, and the longest reigning champion in WWE history, truly one of the greats will be remembered for all time. Johnny Gargano returns to NXT! Gargano was defined by two words for too long, and those words were “Tommaso Ciampa”. His best friend broke his heart while costing him both NXT title and career. For the longest time, Gargano couldn’t even say his name. “But after 37 of the most intense minutes I have ever spent inside a professional wrestling ring”, Gargano stands here proudly, and he has his life back! 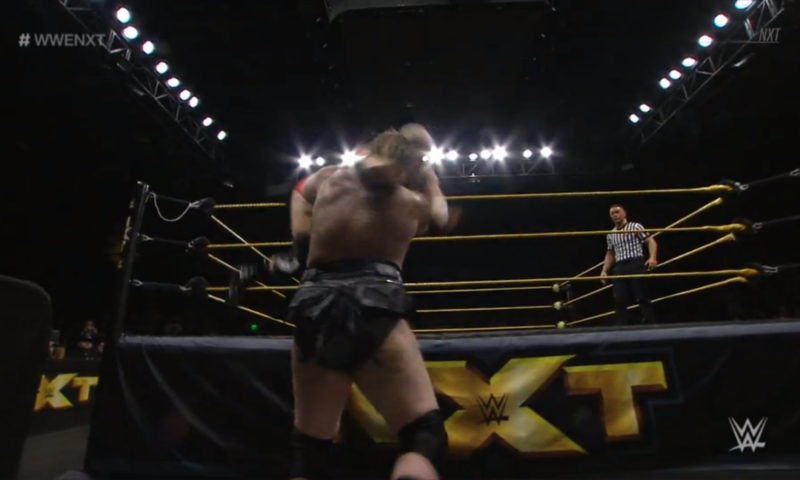 Fans agree with that as they again chant, “Johnny Wrestling!” Gargano confirms, Johnny Wrestling is back in NXT. Gargano admits these have been some of the toughest months in his life, but he loves the fans for shoving the Gargano emojis in Ciampa’s face while chanting his name. The fans chant again, and Gargano thanks each and every person in the NXT Universe that had his back. He also directs thanks to his wife, Candice. 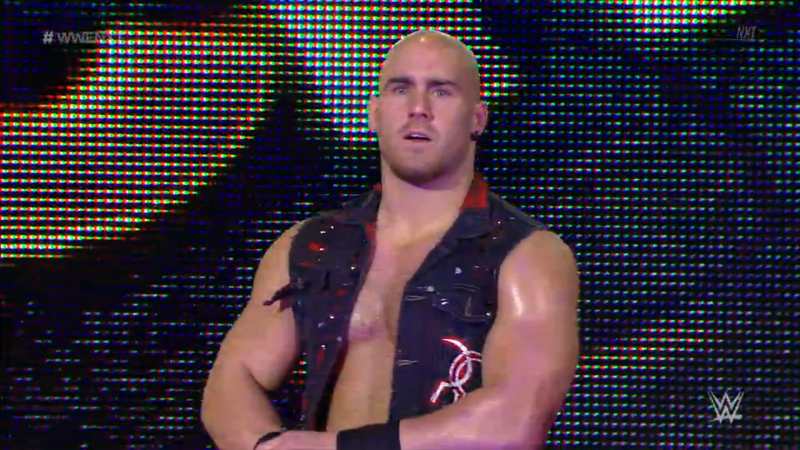 Fans chant for Candice, and she gets a bit bashful, as he knows this was as tough on her as it was on him. But Gargano would not have made it through without her. They hug, but then move on from the “mushy crap”. Gargano is back, and both Johnny and Candice Wrestling have some unfinished business. Candice takes the mic herself, because tonight, she’s handling her business with Zelina Vega! And if Almas tries anything, Gargano will drop Almas like he’s Ciampa. Then, once they get past Almas & Vega, there’s still one more thing. There’s a NEW NXT Champion, “and you’re looking at his first challenger!” Gargano is ready to go for gold again, will he and Candice put their grudges behind them to start fresh? “New Orleans. Lars Sullivan took something from me. He took my chance to write history.” But tonight, Big Damo will use No Disqualification to take everything from Lars! It won’t be Eric Young, Alexander Wolfe or Nikki Cross bring the chaos, but just Big Damo alone! Will the Leviathan survive the wrath of the Beast of Belfast? The #OneAndOnly was also part of TakeOver’s historic ladder match, but was also unsuccessful in winning NXT’s newest title. 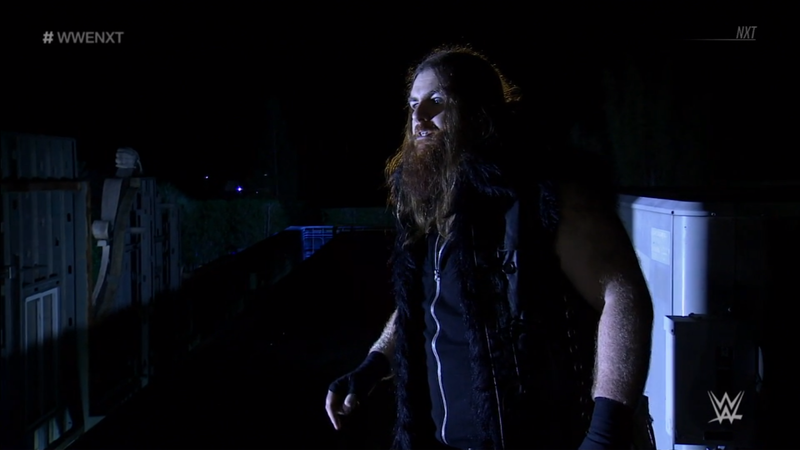 However, he is here now for his Full Sail in-ring debut to carve his path to the top! 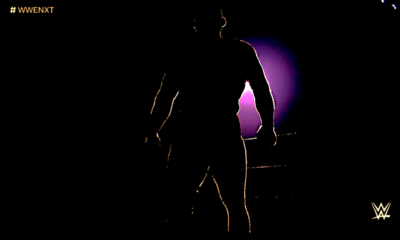 How will he fair against the man who wants to go to the #NXTLVL in his own right? The bell rings and the two circle while fans chant for Ricochet. They tie up, Ricochet gets the waistlock then headlock. Aichner hits back and powers out but Ricochet rolls off his back, under the clothesline, then backwards to headscissor Aichner down. Ricochet kip-up and dropkicks Aichner and fans are fired up. Aichner chops Ricochet back, then whips him to a corner. Ricochet goes up and over then handsprings and jumps, but Aichner catches him into a fireman’s carry! Aichner tosses Ricochet up to bring him down into a gutbuster! Ricochet flounders from the big knee to stomach, but Aichner keeps on him with a mudhole stomp in the corner. 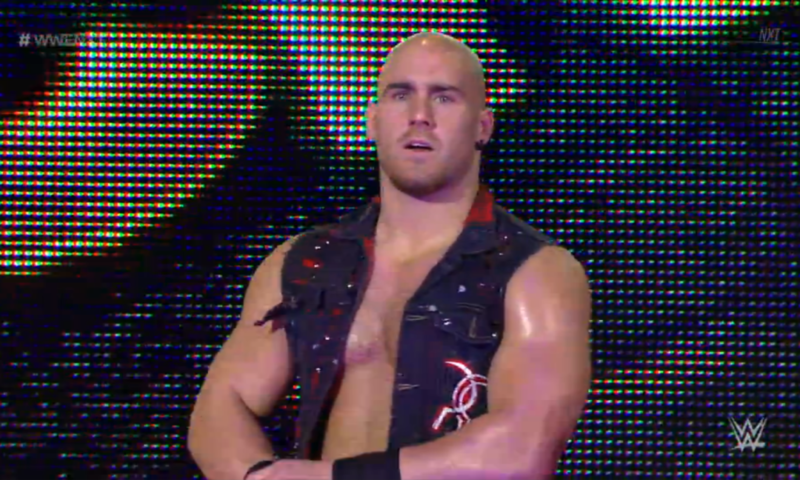 Aichner backs off at the ref’s count, but comes back to stand Ricochet up. 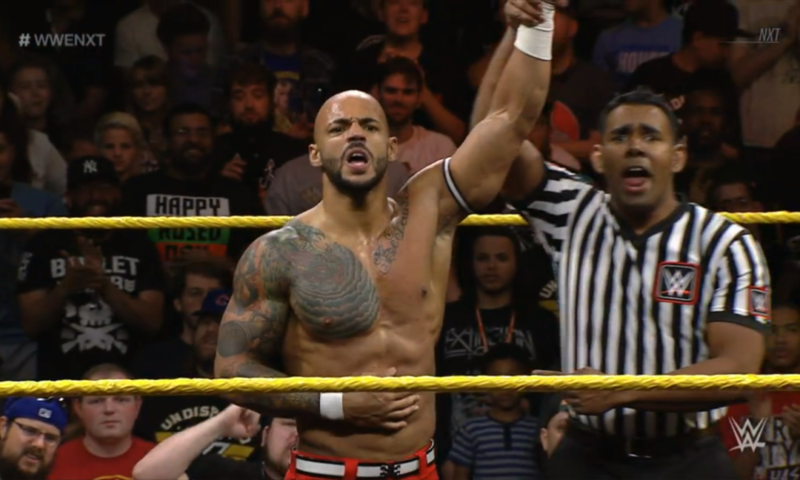 Ricochet turns things around and gives back a sharp chop of his own! Ricochet chops again, then whips Aichner at the ropes. Aichner reverses the whip and catches Ricochet into a tilt-o-whirl backbreaker! Cover, TWO, but Aichner keeps his cool. Aichner sits Ricochet up for a rear bearhug. 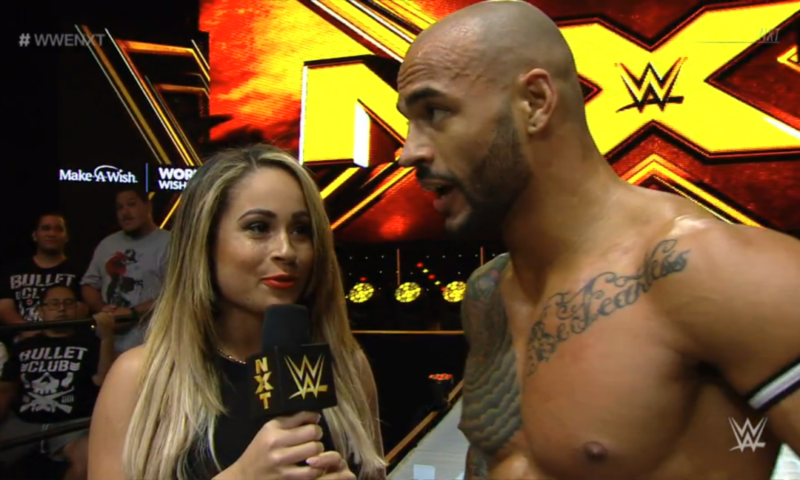 Ricochet endures while fans rally. 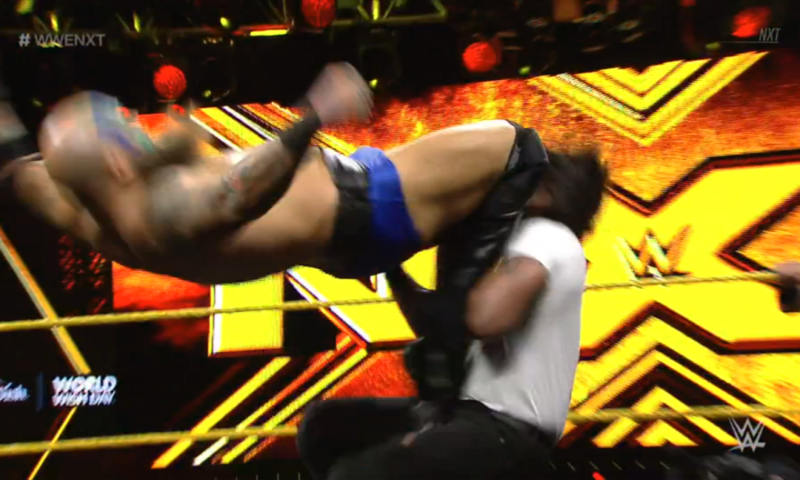 Ricochet stands up and fights out but Aichner rams a knee into Ricochet’s ribs. Aichner brings Ricochet up into bomb position, and shouts, “Next Level!” He lifts Ricochet but Ricochet slips out the back. Ricochet rocks Aichner with a back elbow, then goes to boot, but Aichner blocks. Aichner retaliates with a hard European Uppercut, then whips Ricochet corner to corner. Ricochet manages to boot Aichner this time, then somersaults for a dropkick! Aichner goes down and fans fire up for Ricochet again. Ricochet drags himself up while Aichner stands. Ricochet blocks punches to give punches then rallies with forearms. He runs in at a corner for a big uppercut, then whips corner to corner. Aichner reverses but Ricochet dodges, corner 619 and springboard EuroUpper! 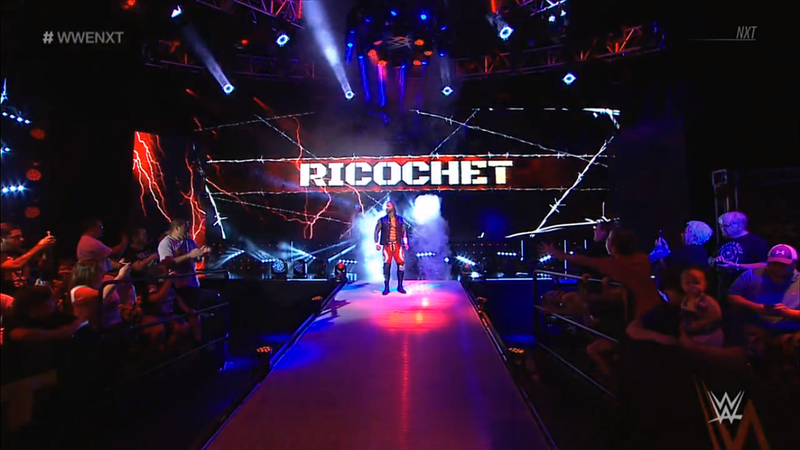 But Ricochet isn’t done there! He hits a standing shooting star, cover, TWO! Ricochet is surprised but keeps his cool. He goes to a corner and climbs up top. Aichner revives and trips Ricochet up, then climbs up to join him. 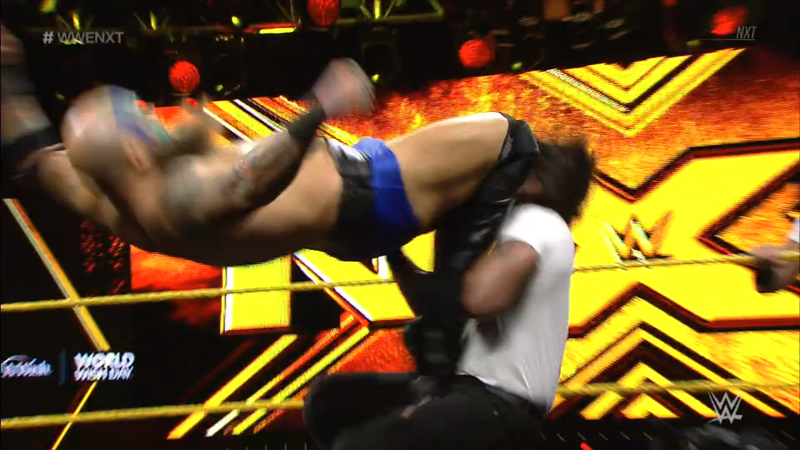 Aichner tries but Ricochet resists the superplex. Ricochet fights Aichner off with body shots then a sharp uppercut. 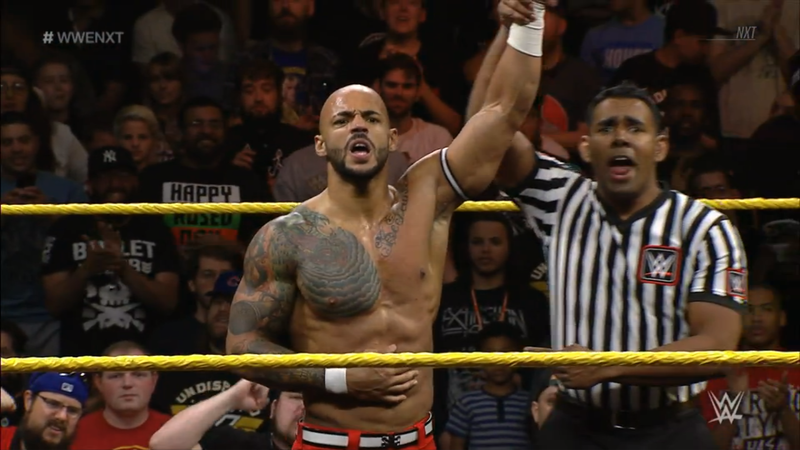 Ricochet adjusts, and hits the 630 senton!! 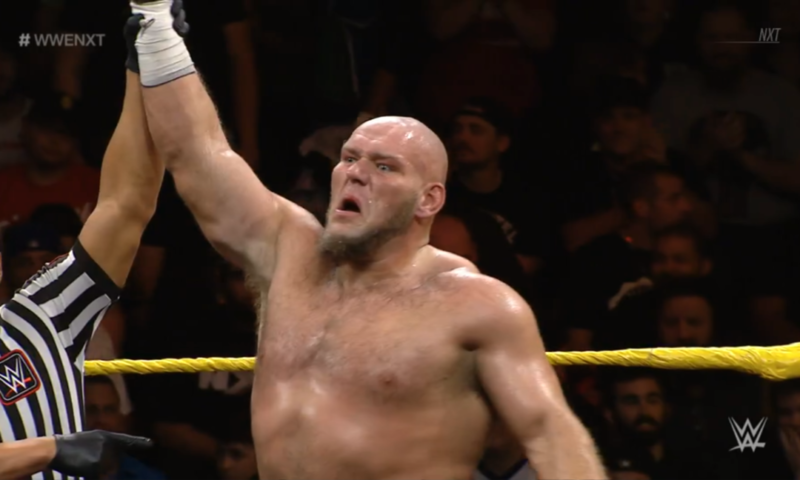 The King of Speed wins his first 1v1 match in NXT! With speed, strength and style, can Ricochet reach the highest heights imaginable? An incredible start to his NXT career, so how does it feel to get his first 1v1 win? It feels great, and fans agree. 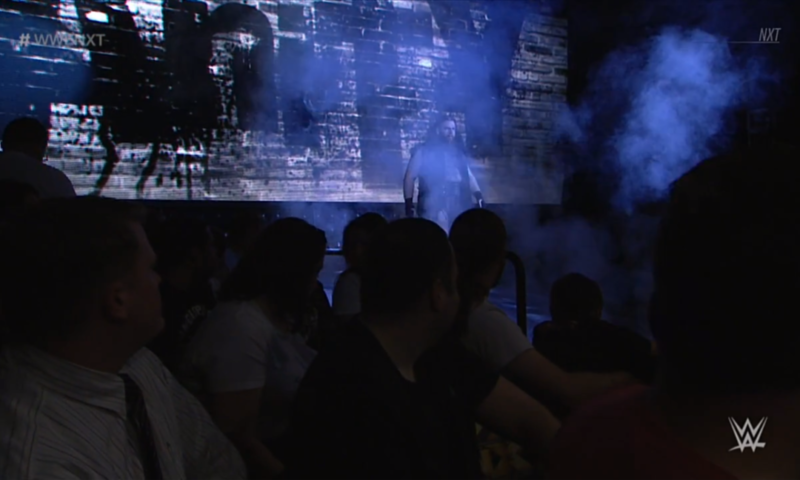 He likes hearing the chants, and he has watched a lot of today’s top stars in WWE make their start here at Full Sail. 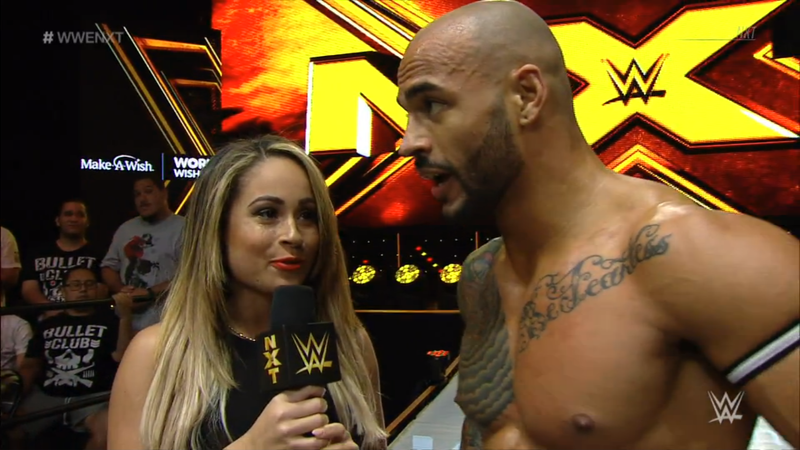 Stars like Bayley, Sami Zayn, Seth Rollins to name a few, “but now it’s my turn.” Ricochet came to NXT to turn things up and make a name for himself. 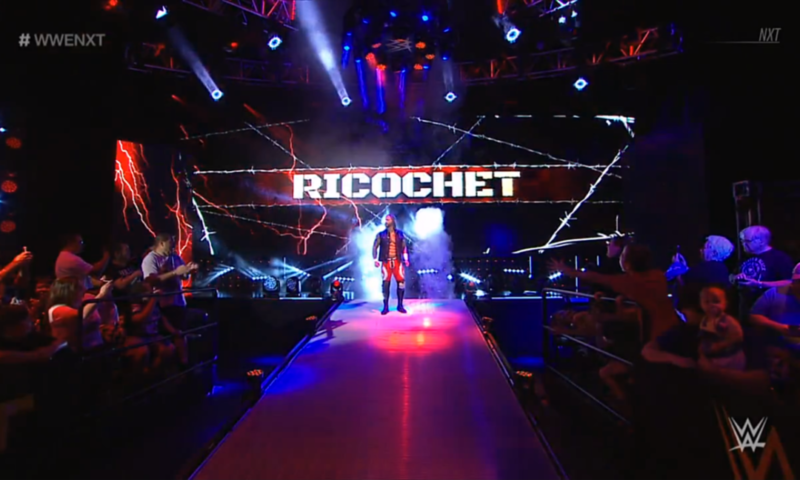 He will prove to everyone why there is #OneAndOnly Ricochet. The King of Speed is ready to be a star, who will he encounter on his path to the top? 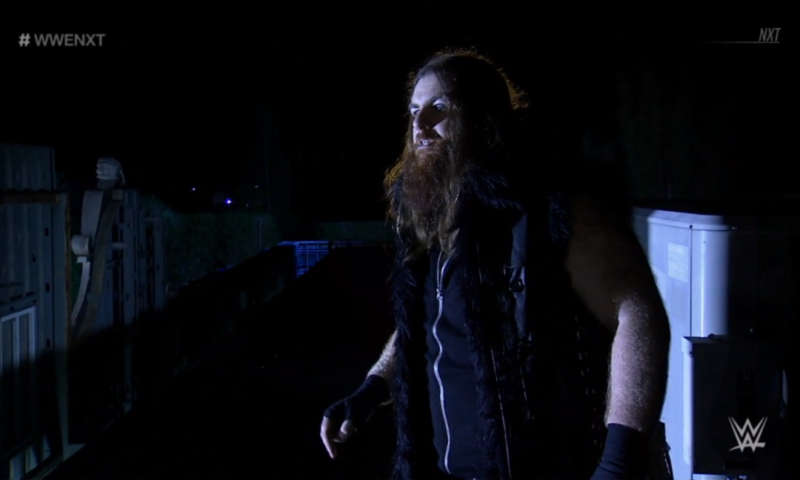 “Tonight, I get Killian Dain in a No Disqualification match.” Which means Lars gets to do whatever he wants to Dain. Whatever comes to mind will happen. 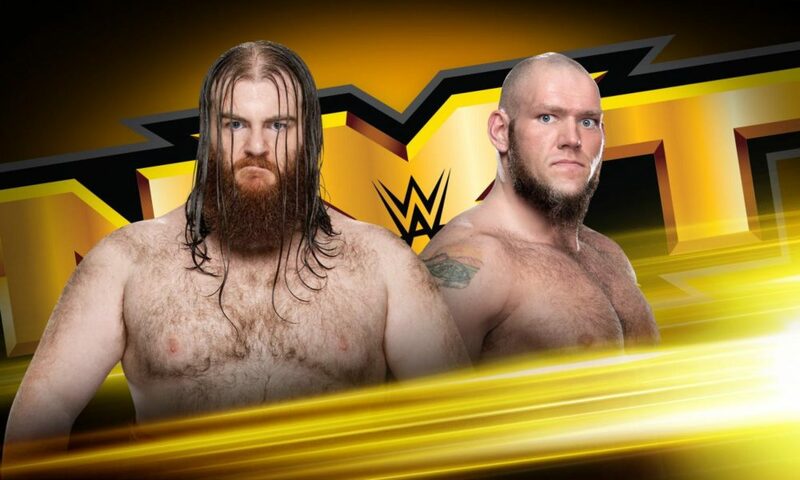 Everyone will see exactly why Lars Sullivan is “a real-life Freak of Nature!” Will the Beast of Belfast be able to even leave Full Sail to make a main roster debut after tonight? War Raiders VS The Metro Brothers! Ray Rowe & “War Beard” Hanson made a riotous debut last week when they wrecked the match between Heavy Machinery and the Blue Chip Boys. They look to continue on that warpath tonight, do JC & Chris stand a chance? 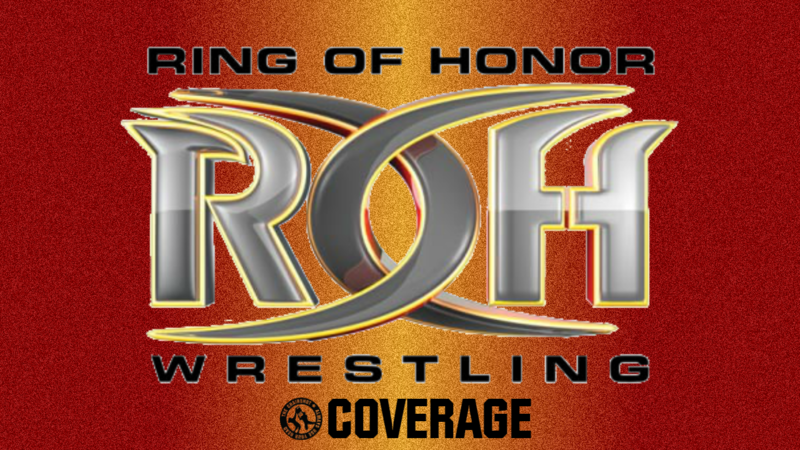 Rowe starts against JC and the bell rings, Rowe immediately hits JC with shotgun knees! Chris can’t believe what happened to his brother right before his eyes. He tags in and tries but Rowe throws him right down. Rowe drags Chris up, Hanson tags in, and the Raiders mug Chris with knees. Hanson gives another big knee, then drags Chris up. Chris chops back but hurts his hand! He runs but Hanson cartwheels and lariats Chris down! Hanson roars and the fans fire up. 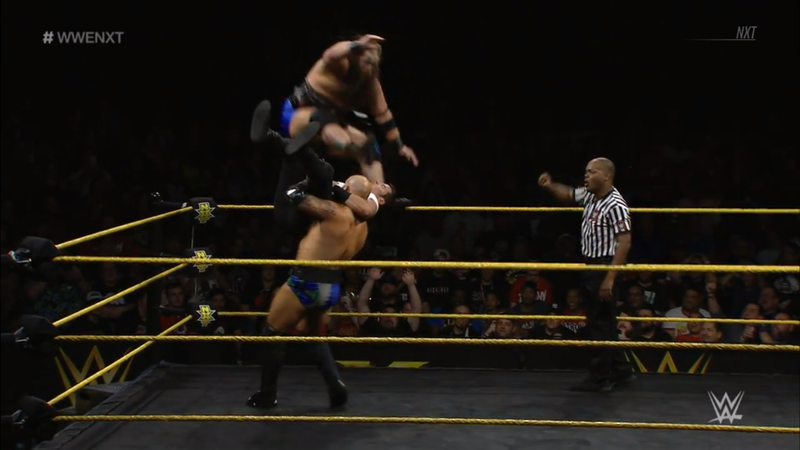 Tag to Rowe, and Hanson feeds Rowe for Rowe to toss Chris up for the pop-up powerslam, Thor’s Hammer! JC returns but Roew gives him Ace Ten Mao! Rowe tags Hanson in before dragging Chris up. Hanson climbs as Rowe lifts Chris, and War Raiders hit FALLOUT! 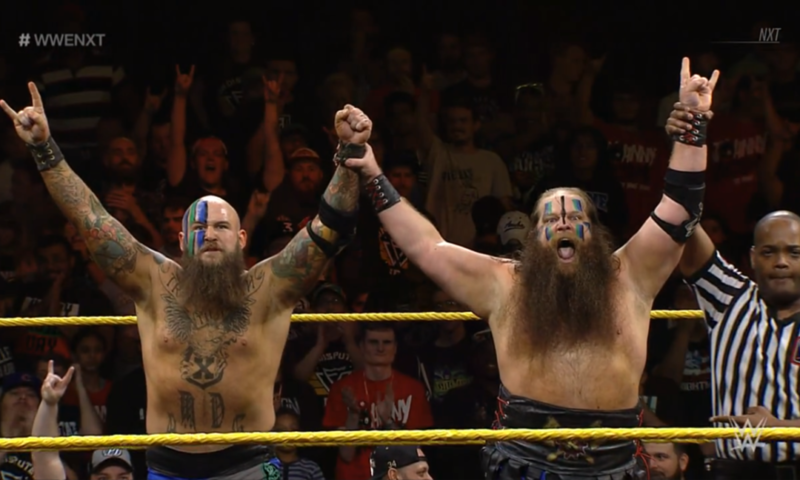 These bearded behemoths will not be stopped now that they’re in NXT, are the Undisputed Era’s days as tag team champions numbered? 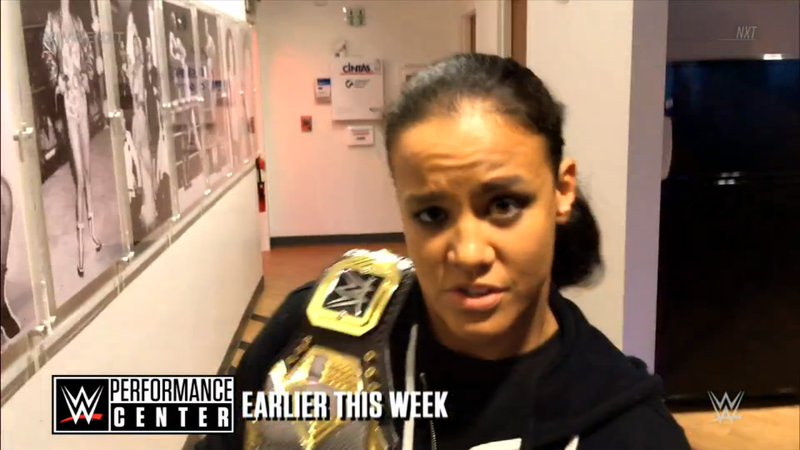 The new NXT Women’s Champion knows a meeting is going on and she’s late to it. But she doesn’t care, she plays by her own rules. Shayna walks into the locker room to interrupt that meeting, as well as Serena Deeb’s pep talk to the other women of the NXT roster. The Queen of Spades lets them all know she runs the locker room now, and makes it even clearer by ripping down Ember Moon’s locker label. Shayna uses a playing card for her label, and tells everyone that there’s no one who can stop the change. She suggests they either get in line or get out of the division. But when Dakota Kai wants to go out and refill her thermos, Shayna gets in her face. Bully Baszler reigns over NXT with an iron fist, who will rise up to lead a revolution? “The Finest Smile, the Finest Jewelry, the Finest Hair.” He’s on his way back, so get ready, for The Finest Kona Reeves. Reinvented and returning, can Kona Reeves reignite his NXT career? 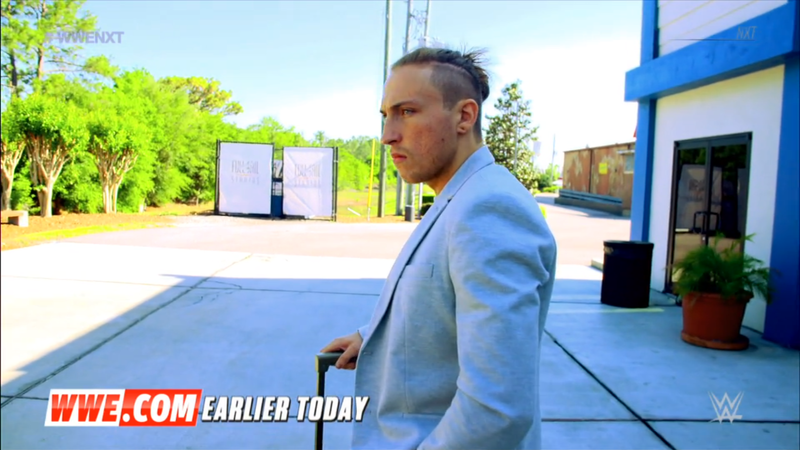 NXT & WWE Media caught up with Pete Dunne. 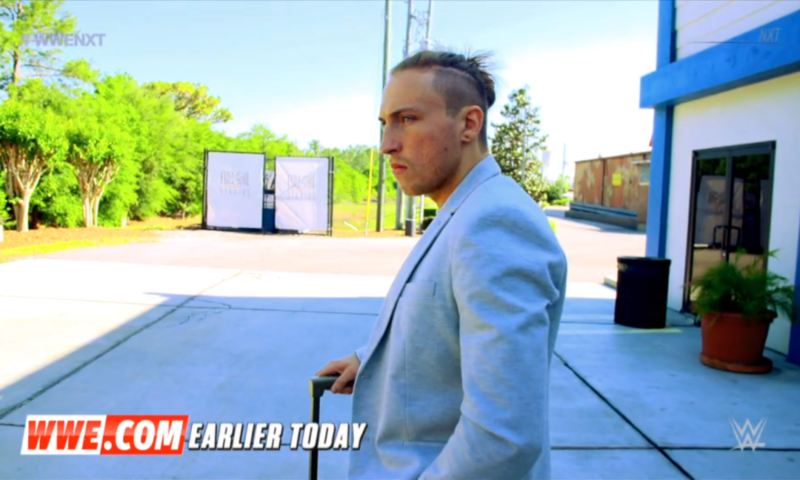 The reporters ask the British Bruiserweight about the betrayal suffered at TakeOver: New Orleans. 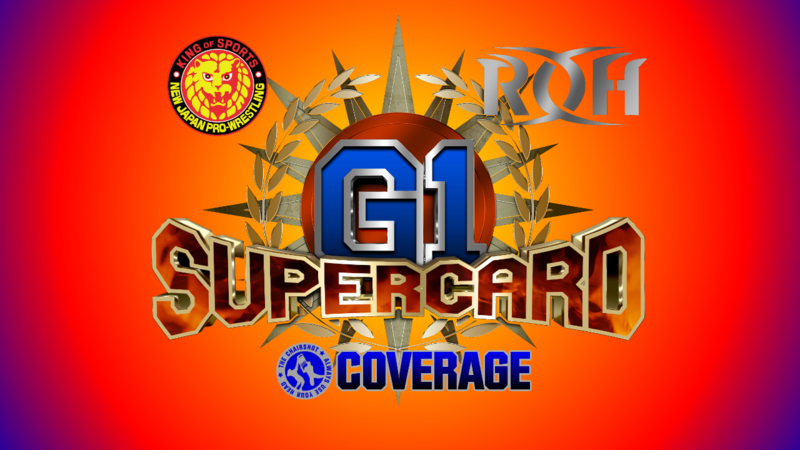 Dunne promises to return in a few weeks, and will show us what he thinks of Roderick Strong the moment he gets his hansd on him. 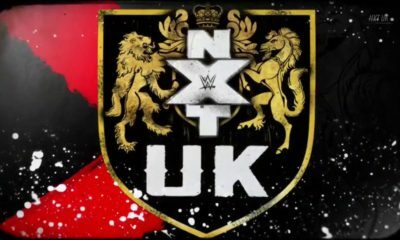 “I’m gonna rip his head off.” The WWE UK Champion kept it short but not so sweet, will he get sweet revenge on the Undisputed Era’s newest recruit? No Disqualifications: Lars Sullivan VS Killian Dain! King Kong VS Godzilla? All the destruction in Rampage the movie? None of that will compare to what’s about to happen between the Leviathan and the Beast of Belfast when there are no rules but to win! With SAnitY headed to SmackDown, will Big Damo’s good-bye match be a violent victory? Or a decimating defeat? The bell rings and the fans chant, “Hoss Fight! Hoss Fight!” Damo and Lars step to each other, Damo being very vocal, then he suddenly headbutts Lars! Lars staggers but Damo keeps on him with forearms. Lars powers Damo to a corner and rams in a shoulder, but Damo hits back with another forearm. Damo keeps Lars on the ropes, then clotheslines him out of the ring. Lars stays on his feet, he drags Damo out to join him. They brawl at ringside and around corners, all the way to the ramp-side of the ring, with the referee following at a safe distance. Lars knees low and whips but Damo reverses to send Lars into steel steps! The referee checks on Lars and determines he’s okay to continue. Damo goes back into the ring, takes aim, and DIVES! But Lars catches him, to then ram Damo into a post! Lars continues by suplexing Damo to the ground! It takes a bit out of both monsters, but Lars is first to stand up. He drags Damo up and into the ring, then rolls him over for clubbing crossface forearms! Lars throws hammering hand after hand into Damo’s face, but Damo still stirs. Lars deadlifts Damo up for a German Suplex! Damo rolls out of the ring and slumps to the floor. Lars exits the ring to climb up to the top! The Leviathan LEAPS for a lethal lariat! 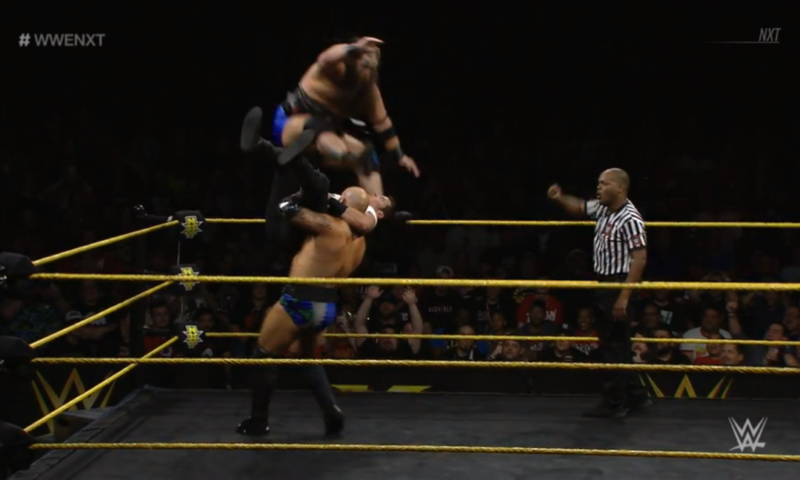 The monsters crash and burn, and fans chant “NXT! 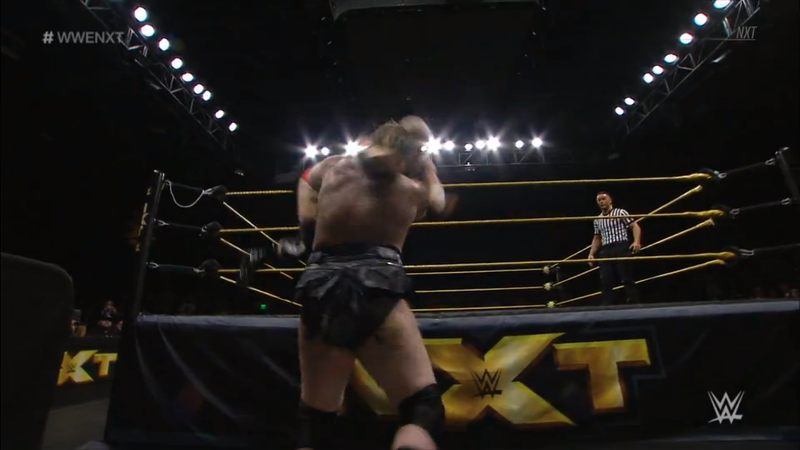 NXT!” while the referee checks on them both. Both men are somehow okay to continue, though Lars has given Damo a bloody nose. Lars stands up first again, and he puts Damo back in the ring. 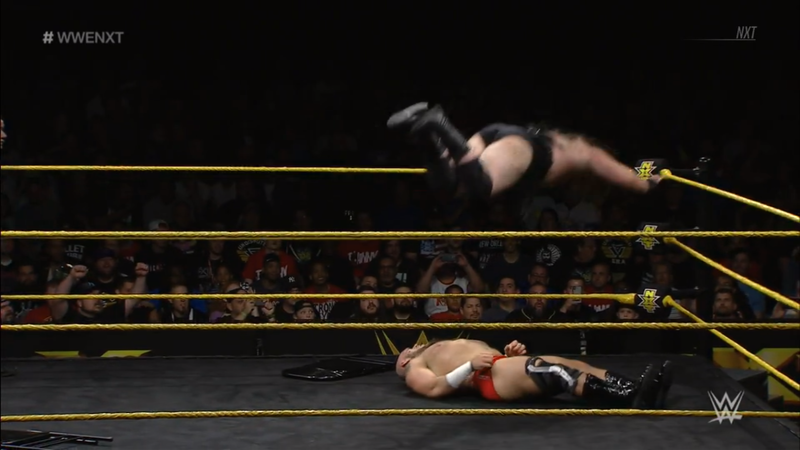 Lars hops up again, for the monster diving headbutt! Cover, TWO! Lars grows frustrated, so he goes outside the ring to fetch something from underneath: a chair! Then another chair, and another chair. 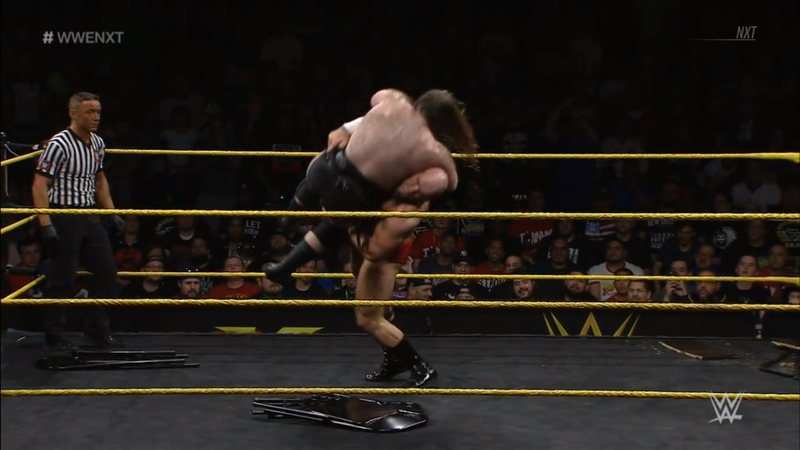 Fans want tables, but Lars settles for these. He picks up one chair, aims at Damo, and jams it into Damo’s ribs. Damo staggers into a corner and Lars goes after him, trying to press the chair into Damo’s head like a vice. Damo fights him off, but Lars runs corner to corner, only to run into Damo’s dropkick! Both behemoths are down, but the fans rally for “Killian! Killian!” With blood dripping from his nose, Damo stands, followed by Lars. Damo throws a forearm, but Lars gives one back. The behemoths brawl, Damo gets the edge but dares Lars to give it back. Lars swings but Damo ducks under to then lift Lars up in a fireman’s carry. Slam and back senton, the Belfast Blitz! But Damo keeps moving, and climbs up the ropes for a Belfast Vader Bomb! Cover, TWO! Frustration grows for Damo, he goes out to search for something under the ring. Fans want a table, so Damo gives them a table! Damo picks the table up and puts it in the ring. Lars stirs while Damo picks up a chair. Damo drives that chair into Lars’ back! Damo then takes the table and props it up in a corner. Lars crawls over, but Damo SMACKS him with that third chair. Damo brings him up and prepares to throw Lars at the table, but Lars fights back. Lars picks Damo up and drops him with a side slam! Lars grabs a chair and presses it into Damo’s chest, then goes to a corner. The Leviathan climbs up again, but Damo moves, and Lars falls on only the chair! Damo fires himself up while Lars writhes and flounders, then lines up the shot. 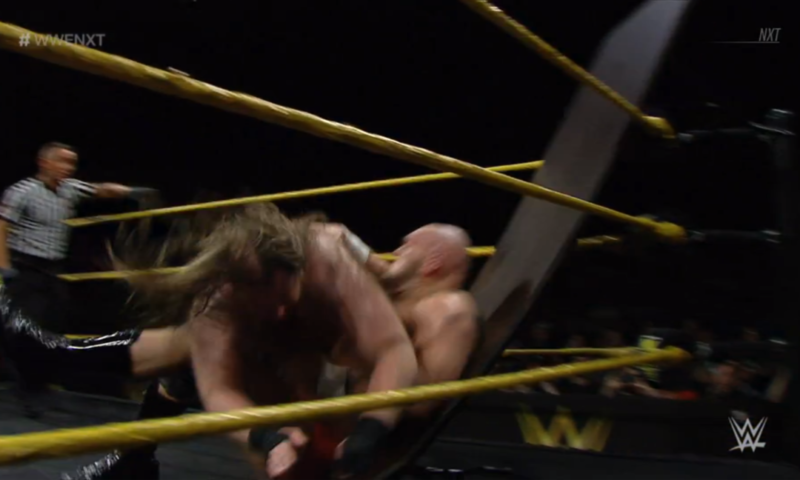 He waits for Lars to stand, then runs out, but Lars catches the Divide crossbody to turn it into a powerslam! Cover, ONE!? Lars is shocked! But he keeps going, bringing Damo up for a scoop. Damo slips out and bicycle boots Lars. Lars staggers and Damo goes back to the corner. Damo runs out again, and the Divide brings them both crashing through the table! Fans chant “NXT! 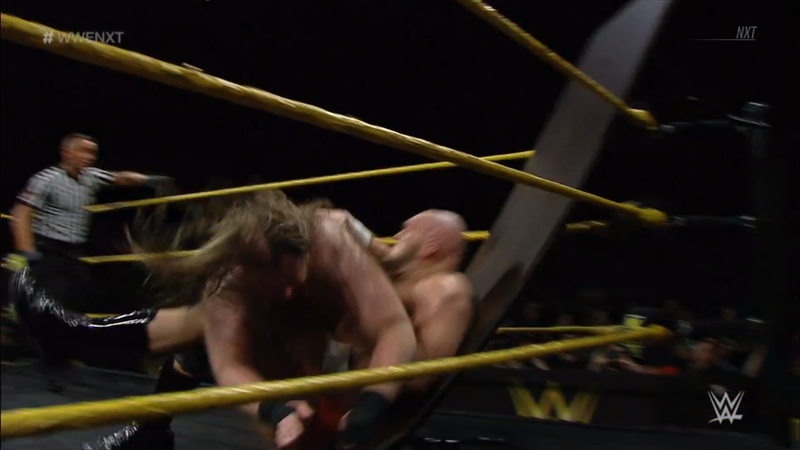 NXT!” while Damo rolls out of the wreckage, leaving Lars amidst the debris. Damo isn’t done, he picks up a chair while the referee digs Lars out. Damo puts the chair on Lars’ chest before stomping a mudhole into him! He then wedges it in front of Lars’ face, and fans anticipate what’s coming. Damo goes to the adjacent corner and climbs up to the top. But Lars revives and goes after Damo with a chair, only for Damo to punch that chair into Lars’ face! Lars staggers around again and Damo adjusts. Damo leaps but Lars thrusts the chair into his ribs! Then Lars SMACKS Damo across the back! Lars stacks chairs and drags Damo up, for a FREAK ACCIDENT! Destructive and dominant, the Leviathan beats the Beast of Belfast! Lars made Damo bleed and he made him fall before Damo leaves for SmackDown. 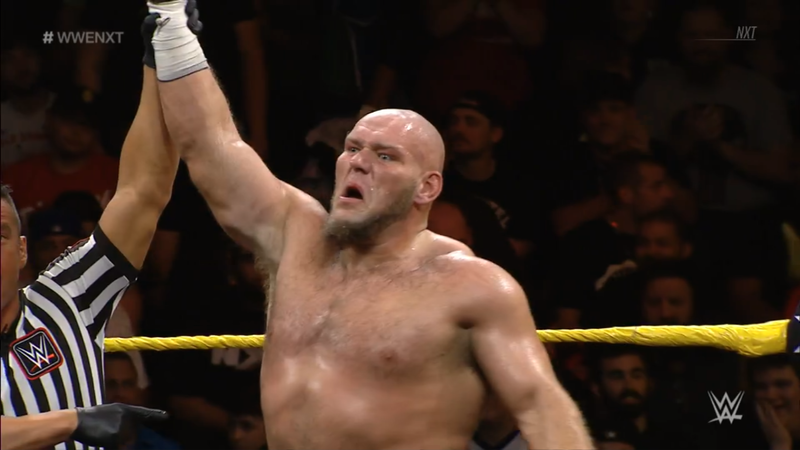 Now that Lars is THE Monster of NXT, is there any hope of stopping him? NXT looks back on the grudge between Andrade Almas, Zelina Vega, and Mr. & Mrs. Wrestling. Johnny Gargano thought 2018 was going to be his year after his wife joined him at Full Sail and the Performance Center. He was so proud to have his favorite wrestler finally make it “where she rightfully belongs” after years of hard work. However, we know things didn’t go Gargano’s way, as Zelina Vega would interfere during his matches with El Idolo. Candice LeRae would get her own shots in on Vega, but in the end, Almas would go 4-0 against Johnny Wrestling. Gargano’s grudge with Tommaso Ciampa aside, Mrs. Wrestling “is just getting started” with La Gerente. They settle things here tonight, will Candice finish it with a win or a loss? The Undisputed Era arrives for their photo shoot. While Bobby Fish is out with his ACL injury, Roderick Strong steps up to be one of the NXT Tag Team Champions. Adam Cole has his own belt now that he’s the inaugural NXT North American Champion, so one thing that is undisputed, is that the Undisputed Era is golden. Will Cole, Fish, O’Reilly and Strong continue to #ShockTheSystem and gather up championships? Candice LeRae VS Zelina Vega! Finally, after a handful of fights that accompanied other superstars’ matches, Mrs. Wrestling and La Gerente del Idolo will fight in their own match! Vega will join Andrade Almas in joining SmackDown, will her good-bye match go her way? Or will karma catch up to her for all she did to Johnny and Candice? The fans are on the side of “Candice Wrestling” even before the bell. Zelina talks trash at the bell and shoves Candice, so Candice shoves back! Zelina runs but Candice blocks her kick. Candice reels Zelina in for a pendulum gutbuster! Candice then goes to the top rope already, but Almas appears out from the crowd! Almas’ distraction repays Zelina for all of hers as Zelina throws Candice to the mat by her hair! Candice flounders while Almas grins and applauds Zelina. 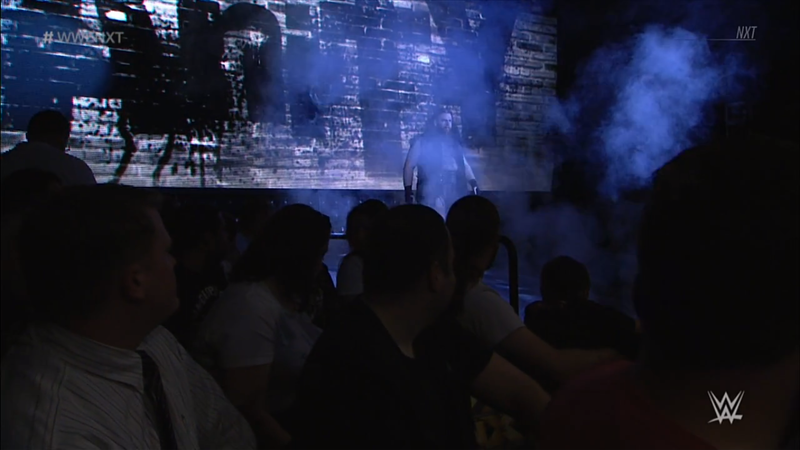 But as he promised at the start, Gargano appears! Zelina throws Candice out right as Gargano approaches, so Mr. Wrestling checks on Mrs. Wrestling first. Zelina hops out of the ring to taunt Gargano while she bounces Candice off the apron. Almas applauds while Zelina puts Candice in the ring and covers, TWO. Zelina keeps on Candice with a dragon sleeper, but Gargano and the fans rally. Candice fights up and backs Zelina into a corner and buckles. Candice breaks free but runs into buckles as Zelina side-steps. Zelina jump kicks Candice down, then a la Almas, she runs in for Cien Knees! Cover, TWO! Gargano applauds but Zelina and Almas are frustrated. Zelina brings Candice up for another page from Almas’ book, but Candice counters the hammerlock DDT into a small package! TWO, and Zelina swings on Candice, but Candice blocks and counters. Candice chops and haymakers Zelina into a corner then fast and furious! The referee backs Candice off but Candice runs in for the back elbow. She lets Zelina fall to then climb up, for the missile dropkick! Cover, TWO! Candice keeps her cool as Gargano and teh fans rally. Zelina throws a forearm then whips, but Candice ducks to tilt-o-whirl Zelina into a takedown! Candice borrows something from Johnny, it’s the GargaNO Escape! Almas runs into the ring, but Gargano intercepts, and now it’s double GargaNO Escapes!! A triumphant return for Mr. Wrestling and a triumphant debut for Mrs. Wrestling, Johnny & Candice are here to stay! They send Almas & Vega packing with that loss, will El Idolo & La Gerente be able to move past it with their fresh start on SmackDown? “First of all, that was awesome!” Fans agree, “That was Awesome!” Second of all, Gargano says that with Almas & Vega taken care of once and for all, “Aleister Black, I am challenging you!” Gargano wants Aleister and the NXT Championship! Speak of the devil, the Embodiment of the End appears. 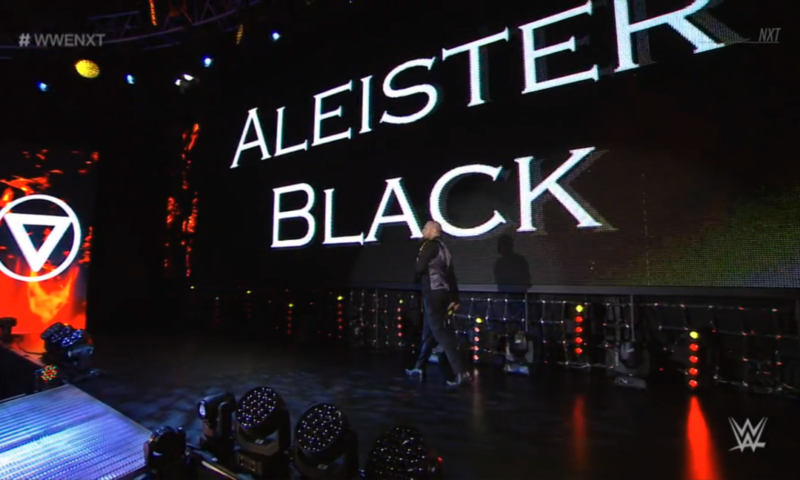 Aleister stands on stage with the title in one hand and a microphone in the other. Gargano is excited but Candice is a bit worried. 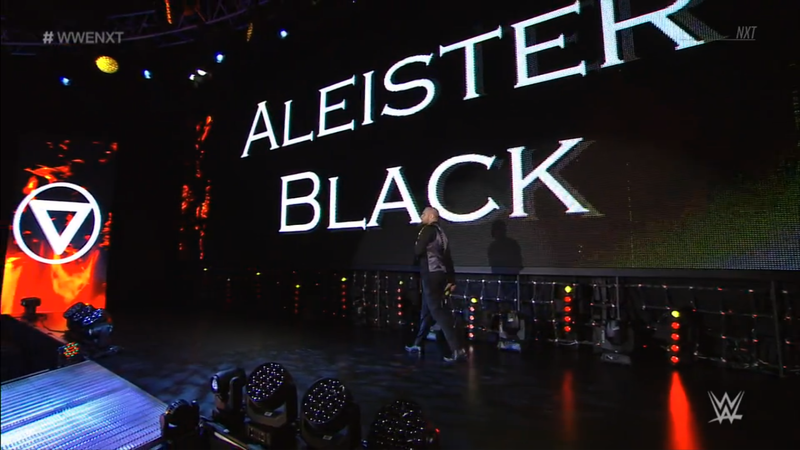 Aleister speaks, “You want it? 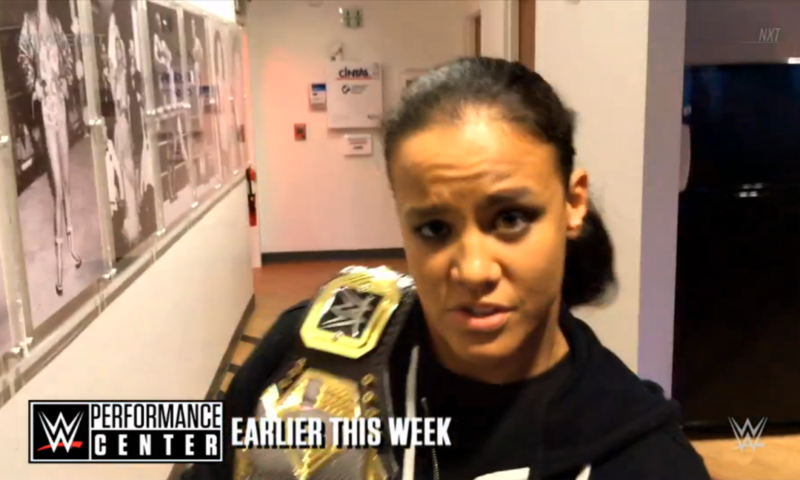 Then next week, you shall have it.” An NXT Championship match, already!? The Dutch Destroyer and Johnny Wrestling are already going 1v1 over the title! Will Gargano achieve his dream so soon after being hired back? Or will he simply #FadeToBlack? A solid episode here tonight. After knowing who is going and who is staying from this recent round of call-ups, this was a great way to shift things to fit the new landscape. Gargano even frames it as much as he promotes Candice VS Zelina for the first time ever as the last time, too. Ricochet and Aichner have a great opening match, and I personally feel a competitive match was better for Ricochet to showcase himself than squashing a jobber. On the other hand, War Raiders squashing the Metro Brothers was actually pretty fun. 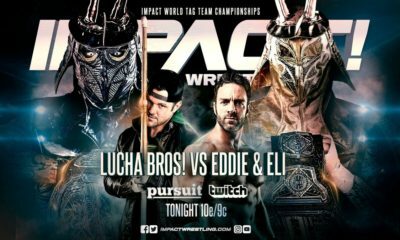 With SAnitY and Authors of Pain both out, Hanson & Rowe will move right in as the powerhouse team. The Undisputed Era is riding high, but with Pete Dunne preparing his revenge and the War Raiders easily a choice for contenders, they’ve got their hands full. Shayna Baszler continues great character work, setting the new ground rules for her vision of the NXT Women’s Division. Something to note is that Nikki Cross is not yet included in SAnitY’s call-up, perhaps she will hang back long enough to challenge Shayna for the title. Meanwhile, it is interesting to see Kona Reeves gets a repackaging as a new superficial and narcissist character. I’m just not sure that’ll be enough to get him going, though. Damo VS Lars was great, and with Damo on his way out, it makes sense for Lars to win. Candice VS Zelina felt like it could have used more time, the spots that happened all felt rushed. 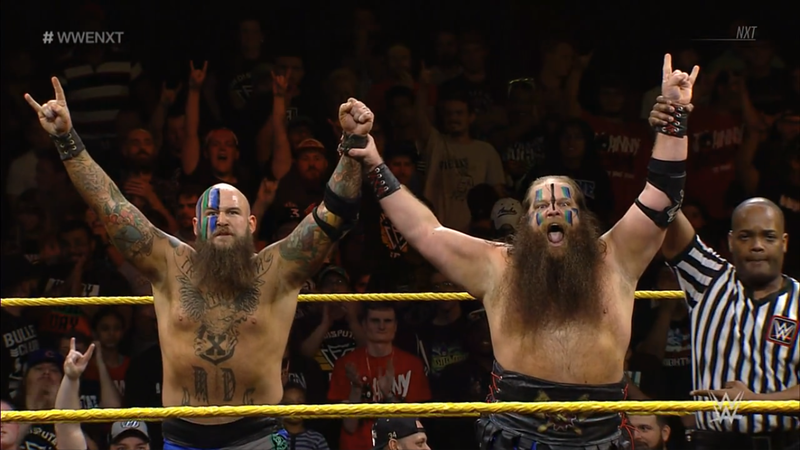 But even so, great to see side-by-side submissions as Candice gets her first victory in NXT. And what a great closing moment! Aleister VS Gargano 1v1 will be another instant classic, no matter who wins.